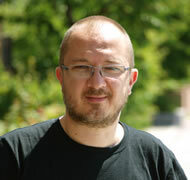 Bostjan has worked closely with Ziga Virc for many years. He has a BA in both Media Studies and Economics. Since 1992, he has worked on hundreds of commercial and broadcasting productions as both a producer and/or script writer. He is experienced in different kinds of productions, including filming climbing expeditions in the harsh and remote glaciers of Alaska, Kyrgyzstan and the Alps. He is a partner in the Studio Virc production company. He connects creative work with a real business environment in an effective synergy.